Whatever your dream house in France may be, in town or country, maison de maître or apartment by the sea (Apartments and flats in France, Property near Sailing Ports / Marinas in France), chalet in the mountains (Ski Chalets for Sale in France) or chateau in the Loire, chances are that at some point you will have to stop dreaming and face up to some of the more prosaic truths of life in France. Like French plumbing. Even if you are moving into a fully finished and modernised house, you still need to understand some of the more basic differences between plumbing systems in France and those that you left behind in the UK, if only to enable you to choose the best tariffs for your water and heating requirements and to enable you to maintain your system and keep things running smoothly. For example, if you are mainly out during the day, at work, and the children are at school (French Education System - Schools in France), you will find that your hot water consumption is best managed on an economy tariff that comes into play at perhaps nine o'clock in the evening, finishing at five o'clock in the morning. The water is heated during these hours and stored for use during the day. It is somewhat akin to Economy Seven and other similar schemes that have existed in England. If you have a large family, or for any other reason (perhaps you plan to run a dog washing service or some such business from home!) feel that you will need a greater amount of hot water, you can find alternative ways of heating the water that will be more economical (Owning Gîtes and Chambres D'Hotes (B&Bs) in France). Solar energy is becoming more and more popular in France, with financial incentives offered by the government to encourage greener practice (Property grants available in France, Green and eco friendly building in France). Whatever you do, do make sure that you do have enough hot water for your needs. There's nothing worse than coming home, cold and tired after a hard days skiing to find that someone has just used the last of the hot water because there isn't enough to fulfil your household's requirements... it really doesn't make for family harmony! In the UK, washing machines and dishwashers tend to draw the hot water that they use from the hot water system in the house, using the water that has already been heated. In France, this is not so, as these machines are almost invariably cold fill only, meaning that they draw in only cold water and heat it to the required temperature. Therefore, if you have opted for an economy evening water heating system with EDF, it is a good idea to run such machines during the designated hours. It is the norm in the UK to have gravity feed hot water with a tank placed in the loft space of the house. In France, however, the tendency is to rely on mains pressure for the hot water feed. Which is best? I suppose it's up to the individual, but we have found that the French system works better and the pressure is excellent. It is quite unnecessary to fit an electric power shower, for example, as you can easily get a power shower effect from the mains pressure. If you are building a house in France (Building or extending property in France), or renovating to any real extent (House Renovations in France), you will probably be faced with a rather different set of plumbing conundrums. The bad news is that the French plumbing systems and materials are quite different in several aspects from the British ones that you may understand. You will need to get used to different sized pipes, with copper input pipes ranging from 28 mm (outer diameter) and 26mm (inner measurement) down to 12 mm (10mm). Where the Brits will solder, the French like to braise... (are we talking about copper or steak here? ), and you will find that the copper pipe joints are supplied "untinned" (without solder) for this reason. You may find that copper pipe in France is supplied in coils, but if you can avoid these it is far better to buy the lengths so that you don't have to spend ages unbending it. If you can't see it sold in lengths just ask... it is perfectly possible to buy it this way, despite appearances to the contrary. However, the advantage of buying copper coils is that these are supplied soft (in an annealed state). Straight lengths are hard, and therefore need to be annealed before bending. The good news is that there are similarities in plumbing too, with toilet and tap fittings (and all threaded fittings) being the same as the UK, in BSP (British standard pipe). DIY or professional best for plumbing in France? Most of the plumbing work can be done by a competent DIYer, although you do need to spend a little time getting to understand the system and materials first. 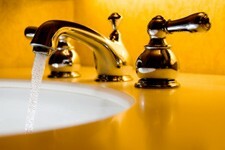 One thing that you must use a professional plumber for, however, is the connection to the house from the main drain. If DIYing, and you are installing a septic tank (Septic tanks in France), be certain that you understand the rules governing these, as they have been subject to updates and changes in recent times. A word of warning, too, if you are planning a new build (New build property in France) or renovation in a rural area. French rural water supply is evaluated by pressure. If the pressure is too low, and there is only a small existing supply pipe in the area that your project is in, this may mean that your planning application is refused. In general, for the water company to consider upgrading supply to a rural area requires applications from several households or potential households as the infrastructure is costly and is the responsibility of the water company. Hi - I came across your site whilst looking for a solution to a heating problem. My central heating boiler in France has given up the ghost (I wonder what that is in French), and I can't believe the cost of a new one. As luck would have it, I'm going back to Blighty in two days, provided of course, I haven't turned into a solid block before then. Do you have any idea whether a British boiler c half the price, will work and be acceptable under the Napoleonic code? If you have any advice, or could suggest alternative sources of information, I would be indebted to you. Many thanks. Thanks for contacting us. I am currently trying to find out about English boilers from my colleague in France, but I'm not having much luck. In the meantime, I'm afraid that as I'm not expert in plumbing in France, I cannot answer your question accurately. I can only say that as many systems operate slightly differently in France with regard to hot water, and the pipework is of different size, you may find an English boiler to be a problem. Hi - I would really value advice re: a bathroom I have just had fitted. I used an English plumber who is registered in France, he was recommended by a property agent. We excepted his devis which was high as he said he could complete the brief to the high quality standard we wanted to achieve (the main reason for doing the bathroom was to get rid of the cheap sanitary fittings and white tiles etc). He said it would take four-five weeks. Well it took double, plus in fact now, week 15, I still do not have the correct taps on the bath, they are being fitted next week. I have ended up with a shower in the wrong place, shower doors (the original I chose had to be changed as the plumber got the size wrong) the replacements doors were nothing like we asked for. These he fitted before asking me and when I told him I did not like the poor quality doors he said, "Yes I was disappointed with them". A cupboard not central and tiling which is really badly done . I did get a qualified tiler to come and advise me on the tiling as I did not want to be unfair when tackling the plumber about my concerns. He only confirmed the poor tiling and highlighted other areas. These were expensive tiles and to re-do will cost a lot not only in time and money. We have repeatedly asked for copies of all receipts which still have not appeared. We have paid on demand all invoices to date but have held back a final payment of approx 2,500 Euros. Oh I forgot I have a broken lock on the French windows caused by the plumber while I was in UK, which I am waiting still to get repaired. This means the house is not secure. How do I get some redress from this or do I have to pay up? Please advise me as I have a meeting with the plumber on Tuesday first thing which I am dreading. He has also sent an extra bill for nearly 400 Euros, part of which is eight hours to fit two and half bits of green board to lower half the ceiling. This was all done in what should have been the time allocated to doing the bathroom so it appears he wants paying twice. I am happy to pay for the extra green board as that was not originally planned. It appears he charges 35 Euros an hour for this work which no way took eight hours. "I would suggest you contact the local prefectures CHAMBRE DE METIERS where the chap will have had to register his details to be issued with a SIRET number... which will be on his devis. They should be able to advise you as to what redress you have. And incidentally, as I understand it, if a registered craftsman does work he has to guarantee it... for quite a long period of time." If she is able to help further I will let you know, but in the meantime however, I would be inclined to proceed as you would in the UK. In your meeting with him, I would discuss with him all the points you mention, and listen to his version of things, and see how you can work things out. It is not in his interest not to be paid, and not in your interest to have shoddy work. I would certainly not pay him any more money though, until his work is of satisfactory standard. Perhaps it is also worth contacting the property agent who recommended him to hear their view on things? I'm sure they would also want to know if someone they are recommending is no good. I wish you luck with it all. Hi - we are in the throws of buying a house in France and need some advice on white goods. We spent a week at the end of October pricing them in the Auvergne region where our house will be and were quite amazed at the cost - sometimes twice the amount for a very basic fridge or washing machine etc. We aim to take the non-plumbing white goods with us from the UK but need to know about the plumbing type white goods. Can you advise? Can we take a UK dishwasher, washing machine, tumble dryer to France and they will work (using adaptor plugs)? Yes, you should be able to take your UK dishwasher, washing machine and tumble dryer to France and they should work if you change the plug. But you might need to bear in mind that the wiring set up may also need to be changed (large household appliances such as these need to be on their own individual spur), and that in France dishwashers and washing machines use cold fill only. We have a house that we are renovating in France and I wish to buy the taps and heated towel rails here (water-heated). The architect is sucking his teeth and saying that the British taps may have different threads etc. Reading your article it appears that this is not so and that there is no problem in me taking them over? Please can you confirm? It will just be basin, sink and bath taps (not showers) and a couple of heated towel rails. Hello - I was wondering where I could buy a book on plumbing standards for plumbers as well as an electrical book. I am living in France. Having just measured a central heating copper pipe to the radiators it looks as if it is 13 mil rather than 15 mil as in the UK. 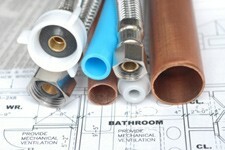 Do you know if the copper pipe size is different than that used in France? Hi - I'd like to buy my sink in the UK. Are UK sinks compatible with French taps and drainage? Ok I am now well and truly confused. I have just bought a house in France and have contacted an English builder to come and quote to fit an en-suite. Whilst checking his web site and testimonials it clearly states that English baths, sinks and toilets will not fit in France as all the pipework is different, yet you state different. Who please knows what they are talking about ! Thanks for contacting us. As above, I have been trying to contact a colleague to find out about this, but have had no luck. You are right in that our article does say "there are similarities in plumbing too, with toilet and tap fittings (and all threaded fittings) being the same as the UK, in BSP", but we also say that the pipe sizes in France are different to that in the UK. Both these statements I understand to be true. I understand many UK items would be ok to use in France, if the threading is the same. It is the pipe work which is the problem in some cases. So I am not sure why UK baths, sinks and toilets cannot be used in France, as long as the pipe work can be sorted out. Hello - I have bought UK radiators and UK valves for the radiators. But apparently they don't fit the French pipes. Can you buy adapters in the UK or France to make them fit? I look forward to hearing from you. Thanks for contacting us, though as I am no expert in these matters, as above I would suggest you check with some builders, perhaps some of those listed on our site (sorry, we don't currently have plumbers listed), in our Business Directory. Hi - I am fitting a new UK oil boiler in France, Brittany. Can I buy pipe fittings to convert from English to French and where, here or there? Many thanks. Do the French do compression fittings for their pipe work and push on fittings? Thanks for contacting us. I'm afraid though I can only say what I've said above, that as I am no expert in these matters, I would suggest you check with some builders, perhaps some of those listed on our site (sorry, we don't currently have plumbers listed), in our Business Directory. We are from South Africa and are now living in Haute-Vienne in France. We need to drain the boiler but it seems very different from the SA ones. Could you please advise how to drain a French Boiler, Aquastic, 200 Litre. I switched off the main water supply and electricity feed to geyser (boiler), opened the hot water tap in bath to drain geyser (boiler) to no avail. Thanks for contacting us. Perhaps you could try contacting some builders/plumbers who work in France, listed in our Business Directory? Or indeed the company who made your boiler? When we burst a water pipe (in our case a rock fell on the brittle plastic pipe and shattered it), by the time our voisins had found out who to contact the Maire had been round and had a commune employee, out of hours, come and switch the water off out in the street. A SAUR employee soon arrived and repaired the damaged pipe; "Ils sont anglais" and all went well. No money was demanded for the communes' wasted water even though offered. I was most impressed. So beware: old plastic pipes are not PE and are a skilled job to repair, the French water pressure is higher and the cold pipe is brittle. I think the electrical part of a spur is wrong. I am sure it has its own fuse and radail as for all fixed items, fridge,washing machine etc. Absolutely superb plumbing fittings - where? In France? Are you kidding? I have found nothing but mismatched junk. Supposedly same threads and pipe sizes not matching and me taking days trawling round various shops to get two fittings that could be screwed or joined together. And toilets that will not stop running on. How hard is it to make a simple shut off valve? In France nearly impossible. Be under no illusion, French production quality is absolutely dire! Having renovated seven properties my advice is to buy your fittings in the UK, as I know lots of professionals do, import and sleep easy that everything fits and works first time, every time. Avoid French plumbing fittings like the plague! I fitted out a small spare room on the first floor of our oldish farmhouse in Finistere as a second bathroom. Vanity unit hand basin, h&c taps, shower cabinet and electric flush toilet (didn't like the idea of big bore pipes so used 40mm waste). I put in a 50 litre hot tank which is fine for our size family. Added an electric heater rail for the towels. I soldered all the joints and after seven years all is running perfectly. I did all the work myself and bought all the hardware, everything, from Brico Depot, Quimper. I found the plumbing section very complete and had no problem with sizes or misfits. The water supply came from the ground floor bathroom and I made sure to put in isolation valves so for leaks or washer changing, the system could easily be shut down. I wish they had designed the original plumbing similarly. Strangely enough I am taking some fittings back to my sister's house in the UK. She needs the mixer in the shower changing and I figured that the one I installed here seven years ago will do fine. Price is about half of the cost in Mr Plumb, Exeter.